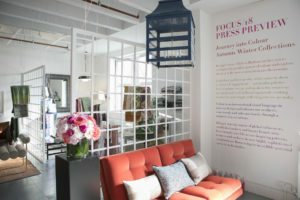 Design Centre, Chelsea Harbour invited key media to explore the new season’s products at the Focus/18 press preview. The show is put together with enormous speed and offers a dynamic snapshot of what’s to come. The latest designs come from far and wide – straight from the printers, artisan workshops and factory floors – literally hot off the press. 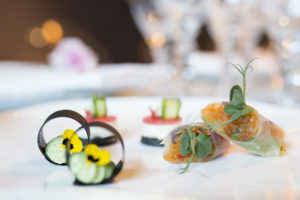 Reflecting the mood of the moment, the event is hugely influential as editors and stylists are able get an overview of the season ahead and plan their features and shoots accordingly. What can we expect at Focus/18? 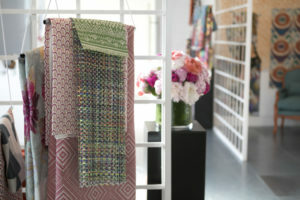 There will be plenty of upbeat patterns and palettes. Look out for the new design directions in the autumn issues. 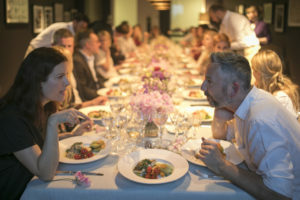 The Editors’ Supper was as a good as its word when noted design editors and media tastemakers came together for a memorable evening at Design Centre, Chelsea Harbour. They enjoyed cocktails at the Focus/18 press preview before moving to a specially curated, softly-lit space for an exquisite dinner. 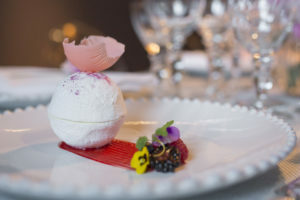 Against a dramatic backdrop, guests marvelled at the flower-filled table. Journalists are hugely important to the design industry, using their platforms to reach audiences, both in print and online. This ability to listen to the world of design and then translate that into something tangible Design Directions of the Future cannot be underestimated.